We're pausing our live coverage of the events in Las Vegas. As more details continue unfold, follow along in our main story here. Here is everything we know so far, a profile of some of the victims, and a look at who was behind the shooting. The CBS network has fired one of its top lawyers after she said she was “not even sympathetic” to victims of the Las Vegas shooting because “country music fans often are Republican”, Fox News reports. A Trump voter who has been in regular contact with our correspondent, Rajini Vaidyanathan, tells her that guns are not the issue here. As scores of Las Vegas residents and visitors wait in long queues to donate blood, emergency officials are requesting that people schedule appointments in order to speed up the process. Donald Trump and Vice President Mike Pence, accompanied by their wives, have just appeared on the White House South Lawn for a moment of silence. With their heads bowed and eyes closed, they listened as a bell tolled for the victims in Las Vegas. So-called Islamic State has released a new claim, stating that the Las Vegas shooter was affiliated with the terror group. Previous claims had been made by the group's publicity wing Amaq, but the latest comes from their central Nashir group, BBC Monitoring reports. They have named the attacker as "Abu Abdul-Barr al-Amriki", but have provided no evidence to support the claim. Police say the gunman is Stephen Paddock, and the FBI has said it has found no links to international terrorism. "Before we start trying to talk about the preventions of what took place last night we need to know more facts. "And right now we're simply not at that point," said White House spokeswoman Sarah Sanders. The answer came in response to a question about a Republican bill that would deregulate the use of gun silencers. "As we tried to make our way out of the parking lot a security guard flagged us down. He had two gunshot victims with him. Read more about how average Americans responded to the deadliest mass shooting in modern American history. "Today is a reflection, a day of mourning," says White House spokeswoman Sarah Sanders, whose voice was breaking as she read out a statement of condolences for the hundreds of victims. "I think that there will be certainly a time for that policy discussion to take place," Sanders said when asked if the president had reconsidered US gun control measures. But now is not that time, she added. During testimony to Congress last week, FBI Director Christopher Wray said there are about 1,000 ongoing, active investigations into potential domestic terrorists. Speaking to the Senate Homeland Security Committee on Wednesday, he described the list as a "very serious" issue that the agency spends "a lot of our time focused on". He noted in his testimony that the threat of domestic terror is much greater than "the threat from ISIS influence", referring to so-called Islamic State. 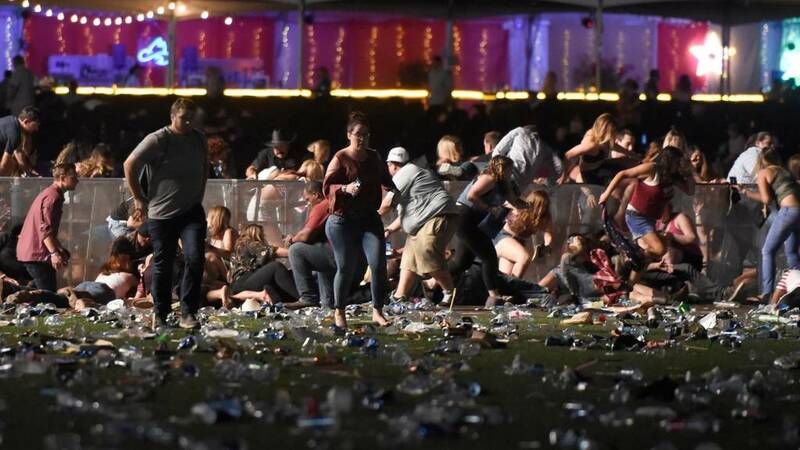 Police have said that the attack in Las Vegas was not terror-related, but so far have not released a motive. Advocates for increased gun control are calling attention to a Republican draft bill which would make it easier for Americans to purchase "silencers" - also known as "suppressors" - which are affixed to the end of gun barrels and are designed to dampen the sound of gunfire. The bill, known as the Sportsmen's Heritage and Recreational Enhancement Act, includes provisions that would deregulate gun silencers. "This legislation is about safety – plain and simple", said South Carolina Congressman Jeff Duncan when he introduced the bill, noting that his own hearing "has been damaged because of gun noise". Debate over the bill was meant to begin next week in Congress after it was delayed over the summer following a gun attack against US congressmen while they practiced for a softball game. Former presidential candidate Hillary Clinton noted on Twitter that the bill is a policy goal of the NRA (National Rifle Association). Former US Congresswoman Gabrielle Giffords - who was shot in the head six years ago - has called for political leaders in Washington to introduce tougher gun restrictions, in the wake of the Las Vegas attack. A joint statement, read out by her husband Mark Kelly, said it required action and leadership from the White House and Congress. "We need a president who recognises that we have a gun violence problem and will work towards solutions. "Americans need more than our president's prayers; we need his plans. We need a Congress who will stand up to the special interests, look at the evidence and act to save lives. "Public safety must be our top priority," the statement said. In Israel, Tel Aviv's city hall has been lit up in the colours of the stars and stripes to honour the victims. "Our hearts break for our American friends and neighbours today. On behalf of all Canadians, I offer my deepest condolences to those who lost loved ones and friends, and my prayers for a fast and full recovery for the many injured. "We stand with the United States, and share their pain and horror at such a senseless and cowardly act of violence. "Las Vegas has long been celebrated by people from around the globe, including many Canadians. We grieve with this city and the United States. Such acts only strengthen our resolve to stand together, united. "This city is a destination for people from around the world, and we are following up on reports of Canadian victims. Consular officials are in close contact with local authorities. "Friends and relatives of Canadian citizens known to be in the area can contact Global Affairs Canada's 24/7 Emergency Watch and Response Centre by calling 613-996-8885 or 1-800-387-3124, or by sending an email to sos@international.gc.ca"
Whitehall sources say that a number of serving personnel from 1st Queen's Dragoon Guard - the Welsh Cavalry - helped look after the wounded on the ground in Las Vegas. They were apparently staying in a hotel near where the shooting took place. One source said the servicemen were off duty after taking part in training operations at Fort Irvin in California. New York City's famous Empire State Building will tonight "be lit in darkness with a rotating orange halo in sympathy for Las Vegas" officials at the iconic skyscraper have said in a press release.